1.6 How We Wrote This Review? 1.7 How big of an air compressor do I need to run air tools? There are dozens of air tools in practice. In case you’re a professional, semi-professional and even hobbyist handyman, you need to use these tools now and then. When it comes to using air tools, the first and foremost requirement is a good source of compressed air. And there comes the role of air compressors for air tools. Finding the best air compressor for air tools is hard. Because every air tool has its requirement. Meeting these requirements and ensuring good functionality is a tough goal to meet. PORTER-CABLE C2002-WK is the crown winner model of today’s list. It’s an oil free model with decent tank size, an excellent motor capacity, and an impressive air pressure range. Accessories: 13 pieces of accessories. Pancake style construction with 6 gallons tank. Comes with a max pressure of 150psi. 2.6 SCFM motor with quick recovery time. Air coupler plugs are provided. Leak-free and takes up less effort to run. Comes with 13 essential accessories. The 25 feet cord might be more than what you usually need. You are not going to work with the same air pressure with this model. Well, the highest and lower range of pressure is 150psi and 90psi of this model. It can also provide you a 120psi cut-in pressure and a 30psi bonus air pressure. To make it even better, Porter Cable had done an excellent job of keeping the recovery time low when you run it at a low pressure of 90psi. And if you’re using it professionally or regularly, quick recovery time is what you always urge for. Now, this is a feature you won’t get to see in many models of the market. This compressor runs on an AC power of 120V. And still, it provides optimal performance. But the real perk of this startup is its functionality even in cold weather. With an extension cord, you can quickly turn this on at cold weather. This compressor can work within several pressure points, including a 30psi bonus pressure. To have a swift control and get the pressure you exactly need, there is a Hi-Flo air regulator provided in it. You can also protect the system from getting damaged with high pressure as well. As you already know, the air compressor is not the only thing you would get inside this box. There is a 13 piece accessory kit in it as well. This set contains a 25 feet hose pipe, a blow gun, a tire chuck, a tire gauge, a set of quick coupler plugs, etc. Leaks and hectic labor- you want none of them to come on your way when you’re deep into your work with this compressor. They’ve kept that in mind and worked accordingly. There is an air coupler and plug right into the factory installed version. This coupler and plug will be in great help to prevent leaks and work labor-free. In case you’re interested in buying an all in one solution of air compressor instead of just the air compressor itself, this BOSTITCH BTFP3KIT 3-Tool Portable Air Compressor Combo Kit would be an ideal pick for you. Apart from the 6 gallons air compressor, you will also have a brad nailer, a straight finish nailer, a heavy duty crown stapler, an air hose, a set of fasteners and of course, a beautiful container bag. This set is almost like the 360-degree solution for carpenting, woodworking, and many other similar jobs. 18 gauge brad nailer provided. 16 gauge straight finish nailer provided. ⅜ inches crown staples come with the box. 15 feet air hose for a comfortable range of works. Sample fasteners are there in the box. Its beautiful as a combo kit, individually the compressor itself isn’t that much power. In this combo kit, the first item that anyone would look for is the pancake style air compressor. Like any other decent pancake model, it can hold up to 6 gallons of compressed air. And it’s excellent for regular carpentry of light-medium fastening jobs. An air pressure of max 150 psi is not a bad score, as long as you think about regular pancake style compressors. This would help you to deal with air tools like brad nailers, finish nailers, staplers, etc. With 150 psi, you can easily fasten nails oil-free. We won’t claim that 2.65CFM is the best available motor in there among air compressors. But as we said, this kit is supposed to deal with low to mid-level of carpentry works. In that sense, it’s subtle enough. As you can see in the picture, two major companions of the compressor are the brad nailer and finish nailer. The brad nailer is of 18 gauge with nail compatibility of ⅝ inches to 2 inches. The other big tool you might look for is the Straight-type finish nailer. The finish nailer is of 16 gauge, and it has nail compatibility of 1-¼ inches to 2-½ inches. Again, for mid-chore finish nailers, this is good enough. In case you require an air compressor with which you will do the mid or low level of inflation works, the BOSTITCH BTFP02012-WPK 6-Gallon 150 PSI Oil-Free Compressor Kit might be a good option for you. It’s less noisy, lightweight and compact. And still, it can provide you with a pressure of up to 90psi. Accessories: 11 pieces of accessories. 80 dB low noise operation. High flow regulator and dual couplers. 29 pounds of lightweight, easy to carry. 50 feet rubber made air hose. 11 accessories come with it. Pretty much low price point. Can’t provide more pressure than 90psi. A couple of the best part of this model is the dual coupler and a high flow air pressure regulator. With the high flow regulator, you can acquire the pressure between 40 to 90psi. If you are a professional handyman, the air compressor noise might not bother you so much. In case you’re using it in the home garage, you should be aware of the noise that it’s producing. Worry not, however. This model comes with a tested noise production of only 80 dBA, which is known to be one of the lowest noisy models in the market. As it’s a pancake style compressor, you’re supposed to carry it around now and then. To give you a hand, the model already comes with a pretty compact diameter. The weight of the model is only 29 pounds which is another selling point of this model. In spite of having a regular capacity of 6 gallons, such weight range is a rare fact to happen. As you have seen in case of all previous models, good quality air compressors come with a set of accessories as well. Although this model is a budget-friendly mode, it has still some companions with it. You will get a 50 feet (ca. 15 m) rubber blend air hose and 10 pieces of blow gun and inflation accessories. All these might give you a right hand in inflating tires and other uses of compressed air as well. Although it’s one of the significant features of an air compressor, this model seems to go a bit low in this regard. The minimum and maximum pressure are within 40psi and 90psi. With this pressure provided, you can do any mid-level or low-level use of inflation and pressure injected nailing. Construction of an air compressor plays a significant role to define its durability and performance consistency. In this regard, having a cast iron made model would be a great plus for any workman out there. 2.0 HP high motor power. 2.6-gallon tank for holding up compressed air. Draws low power with only 12.4 amp. Solid cast iron made a construction. Oil lubricated design for less heat and more lifespan. Weighs 52 pounds, which is pretty heavy. The best thing to pick up from the specs list of this model is the cast iron made pump, the big bore cylinder to hold up compressed air, and a maximum stroke delivery. In case you’re too much worried about air compressor bursting, and so, this is the model for you. The motor inside this model is of 2.0 HP power. That being said, this motor can produce up to 1720 RPM of speed. As a benefit, you will get a better displacement (due to the compressed air) with lower noise. Because another perk of this model is its low noise creation. To power up this model of air compressor, you don’t have to spend up to a fortune. As you know, low amp drawing costs less current power; this model will show you how to do this. For safety purpose, there are tripped circuit breakers. It will also prevent the voltage drop from harming the inner parts of the mode. A common problem while running the air compressor regularly is, it produces a tremendous amount of heat. Which eventually, leads it to wear, and reduce the lifespan of the model. But Makita had been ultra careful in this regard. They’ve ensured oil-based lubrication, which gives it the ability to run cooler. Eventually, less wearing and more durability take place. Carrying air compressors from one place to another is a regular job that carpenters have to do. To make the job more comfortable for you, there are roll bar handles provided. With those, you can carry the whole compressor just with one hand. Senco PC1010 Compressor is the last pick of our list of Top 5. And for this time, we tried to pick up the best air compressor for air tools within the low end. By the low end, it doesn’t indicate the performance and quality. It’s just made up for works which require not-to-high pressure and tank capacity. 1 HP peak power and ½ HP running power. 20 pounds of total weight only. Less noise, perfect for household works. Aluminum made highly durable air tank. No accessories or kits provided. Like any regular compressor, this model has two different values of power that it provides throughout the work. But the special fact about this model is, both of these two ranges are made for low-end tasks. The peak power of this model is 1HP, and the running power is ½ HP, which seems all good. The pressure output that this model can provide is 120psi, which is pretty surprising for such a low-end model. The output can be combined with ¼ inches disconnect coupler. Although this is not a regular feature, we found it essential to let you know. And the fact is, this compressor is mainly made for low-end home improvement works. No matter you’re doing a home shifting, or a home renovation, this tool will be a perfect companion of yours. In terms of weight, this Senco PC1010 is the lightest mode of the list. As you can see, 20 pounds is carriable with almost no hard effort at all. So, if lightweight is at your requirement list, you can look up for this model. The products that we have selected, and the way we’ve understood the real-time features of the specs- are completely reliable ways. Our in house experts have taken 43 models in consideration, where all of these were popular as air tool compressors. Rigidity and strength of the construction. Motor power and difference between regular and peak power. Number and types of accessories. Compressed air is the main fuel behind any air tool. But based on the size and functions of a particular air tool, the requirement of compressors varies a lot. 0-90 psi: Air ratchet, Airbrush, Air hammer, Angle grinder, Backfill tamper, Impact wrenches, Nail gun, etc. 90-120 psi: Jackhammer, Pneumatic hammer, Pneumatic drill, Pneumatic jack, Pneumatic paint shaker, Pneumatic riveter, Sanders, etc. 120-200 psi: Sandblaster, Paint sprayer, Riveting hammer, Needle scaler, etc. Question #1: What size air compressor do I need for air tools? Answer: Size is a distinct term when it comes to defining the capacity of air tools. If you indicate it as a size of the tank, we would recommend air compressors with 4 to 6 gallons of tank capacity in usual. Question #2: What size air compressor do I need for impact tools? Answer: As you know, most of the impact tools are at low of air compressor requirement. Usually, around 90psi of compressor size would do. Question #3: Can you use compressor oil in air tools? Answer: If it’s for the lubrication purposes, yeah, you can. So, that’s the wrap up for the list of best air compressor for air tools. 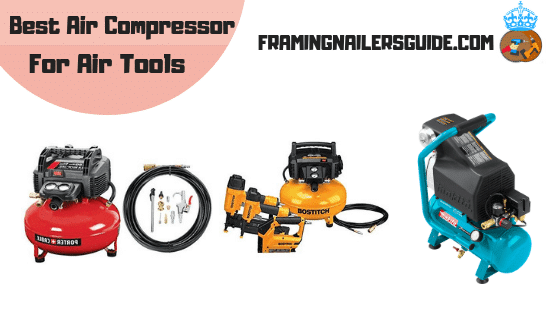 No matter which type of air tools you have, we’re sure that you will find the right suit of air compressor model within this list. One last advice from our side would be to keep an eye on the price-quality ratio.